Deejay, mixmaster and artist DJ MAJ has been a pivotal figure in the evolution of holy hip-hop. Clare Spencer reports. DJ Maj, the deejay, mixmaster and now MC from Lafayette, Lousiana has already contributed his part to the evolution of CCM. He is the man responsible for bringing the esoteric delights of the "mix tape" format to an unhip Christian marketplace. Slowly but surely the radical remixes of tracks by artists like TobyMac, Kirk Franklin, Grits, 4th Avenue Jones and Out Of Eden featured on DJ Maj's Gotee albums 'Waxmuseum' (2000), 'Full Plates' (2001) and 'The Ringleader' (2003) have found a growing audience. Now, after years of mixing others' tunes, he's making his own music as an MC on his album 'BoogiRoot'. The first question for DJ Maj on our lips is "what is a boogi root?" He responded, "It's my spice that I'm putting in the culture from a hip-hop perspective. In nature, the root goes to places the rest of the plant or tree can't go - yet it remains a part of the greater plant body. I feel in my gut that this record has the potential to go places where others haven't gone - I want to bring spiritual nutrition to culture as a whole. And the boogie part is just me saying that we should all have a good time while we're getting the message." The general theme of the album is life and life everlasting. It starts off with "Love (So Beautiful)," which marvels, "They had the same luggage, name tags and all/Even signalled for the same sky cap on call/Fast forward 40 years through peace and arguments/They still hold hands on that old park bench." DJ Mac was inspired by constantly coming in and out of airports. "I watch people embracing each other on baggage claim and wonder what their story is." "Ballin' Chains" and "H.A.N.D.S" are a cry to people who feel there has to be more to life. "It's me saying 'I know you're tired. So why don't you just give it all away? Starting with your life to God.'" Or as DJ Maj puts it in "Ballin' Chains", "I say we take it back to the place where life is more than chasing groupies and cake." In hip-hop, ballin' means having all the money and all the girls, but as Maj explained, in the song it has another meaning as well, "We're killing ourselves just to attain the ball and chain which has the potential to be the very thing that's dragging us down and killing us." The play on words in Ballin' Chains is a classic example of Maj's poetic talent unleashed as an MC throughout the album but previously unseen as a DJ. 'BoogiRoot' is also DJ Mag's first opportunity to express his own personality as an MC. "This album is me. Before I was the conductor - but this is the Maj album." Born Mike Allen, his friends gave him the name DJ Maj after watching his dazzling dexterity on the turntables. Mike only started to learn to deejay because his friend who was a DJ moved away from Louisiana so he felt he had to learn it all for himself. 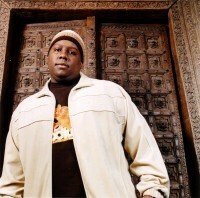 Maj carried it on as a way of paying his way through technical college and soon perfected the art of bringing holy hip-hop to the mainstream audience, "They want urban music but the kids may not know the urban Christian music so we have to play what's familiar and mix in what I'm trying to introduce them to." Maj claimed he can always get the crowd jumping: "I've always made the mix work, because I've always figured out something to do to get people moving, down to a karaoke situation if I have to get people involved. There's always been something up my sleeve to get people going - unless it's a retirement home. I don't do too well there." His favourite deejaying trick is the beat juggle. He explained, "You take a copy of one song on two different records and, using back and forth techniques on the mixer and turntable, take the beat of the song and turn it into an entirely new beat." While at college, the deejaying turned out to give DJ Maj more than just some extra pocket money. He commented, "For me, an African-American young man without musical training, hip-hop gave me something to do - and someone to look up to besides drug dealers." In 2002, Maj moved to the epicentre of Christian Music, Nashville. However, he found Christian hip-hop wasn't taken seriously. "But instead of griping, I started a radio show, just to raise awareness of Christian urban music. I just want to get this music out to the people."